Loft conversions are an excellent way of making the most of your unused space. Regardless of whether you’re looking at this option for a new bedroom or a lounge, a Duratech window is guaranteed to enhance the new space and add functionality. It’s very important to take into account that installing new windows has an impact on your home’s general energy efficiency. Duratech glazing and frames are manufactured using the very latest in insulation technology so you can sit back and relax knowing that they will keep your utility bills down. We have a number of pivot options available for you to choose from. That means you can focus on the smaller details. Regardless of whether you would like your window to open wide or are more conscious about security, we are sure that we have your ideal option available. If you’re looking for a design that offers maximum safety and amazing style, then the Duratech MOEVX B500 will be your perfect window. The main feature is the ¾ pivot with gas springs positioned specifically to allow the maximum opening with little to no interruption to your indoor space. These top hung windows comply with escape window regulations. They are still child friendly, however, and you have the option of purchasing additional safety locks if you think they will be required. The windows are easily operated via the moulded zinc handle that allows for two opening positions for passive ventilation. Another great feature is the open-and-shut trickle vent that allows air to filter through the room even when the window is closed and the main mechanism is locked into place. Made from high quality Scandinavian Pine, the Duratech MOEVX B500 has been impregnated with fungicide and then covered with a clear water based lacquer to guarantee their durability and longevity. 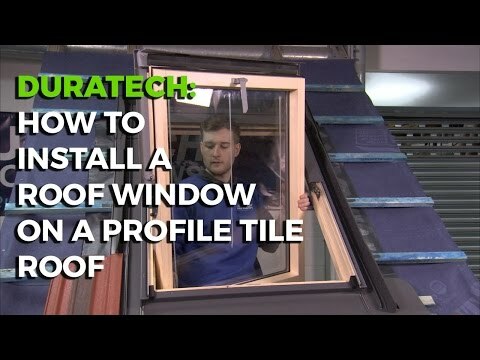 These windows will be suitable for roof pitches from 15 to 90 degrees. The innovative design lets them sit lower into the roofline which makes for a great external appearance. The glazing is 24mm thick and consists of three layers including two 4mm panels of coat glass that are separated by a 16mm gap filled with argon gas. These windows are guaranteed to keep your property warm in the winter and cool in the summer due to their energy efficient U-value of 1.1 W / m²K. A fantastic safety feature is the external pane with toughened glass. The materials has gone through a tempering process. What this means is that if there’s an impact, the glass will shatter into dulled-edge cubes instead of sharp shards making it a much safer option. The Duratech MOEVX B500 has been manufactured in an ISO 9001, ISO 14001 and OHSAS 18001 certified facility so you can rest assured knowing that quality control is a top priority. Using the latest in technology, Duratech guarantees that the best industrial, environmental and labour standards are always achieved. There are a number of flashing options available for Duratech windows. Regardless of whether you would prefer to stick with a single style or go for a combination option, we are sure you can find something that will blend in seamlessly with your property.